Gas producers make major investments in process equipment, but at the end of day, the system can only be as efficient as its weakest link. Even if every part of the process system was once perfectly matched and tuned, operating conditions and requirements are dynamic. Changes to the flow of the raw product or to the delivery envelope can reduce the value of the saleable product or increase costs. Next thing you know, one component is holding up the show and costs are mounting quickly. The Process team at Compass, led by Manager, Paul Murray, are experts at resolving process equipment bottlenecks and getting clients’ valuable gas moving efficiently. 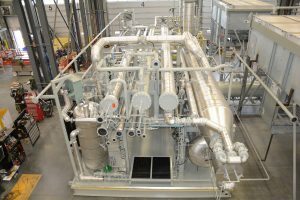 For Murray’s team, a good deal of their work involves evaluating the efficiency of compression and process systems and making adjustments so equipment runs within the desired envelope. De-bottlenecking often involves significant changes to the equipment setup. Getting it right can make the difference between a tolerable expense, and a costly solution with a prolonged shutdown, putting the whole project in jeopardy. Compass’ Process group stands out for its technical expertise, deep experience and the technical creativity that expertise and experience make possible. In one recent field assignment, a client needed to increase throughput, and meet a changing pipeline specification at a gas dew point control plant system. With a significant amount of work already done by the client, the technical consensus recommended the purchase of new and more expensive equipment. Compass’ assessment yielded a quicker, cheaper solution: the installation of a glycol injection system and an additional low temperature separator. To Murray, this project serves as an example of a successful de-bottlenecking and how Compass’ approach to balancing capital costs with operating costs, and construction time focuses squarely on helping the client achieve their goals.